New York Rangers President and General Manager Glen Sather announced today that the club has acquired forward Andreas Thuresson from Nashville in exchange for forward Brodie Dupont. Thuresson, 23, skated in 76 games with the Milwaukee Admirals of the American Hockey League (AHL) last season, registering 14 goals and 24 assists for 38 points, along with 41 penalty minutes. He established AHL career-highs in assists, points, penalty minutes, power play goals (five), and shots (157), and tied his career-high in goals. Thuresson tied for second on the Admirals in power play goals, fourth in goals and ranked fifth in points. He tied his career-highs with seven multi-point performances and a five-game point streak from March 22 vs. Oklahoma City to March 30 vs. San Antonio (three goals, three assists over the span). Andreas Thuresson, who has 118 points in 277 career AHL games, saw his first NHL action with Nashville during the 2009-10 season -- making his NHL debut vs. Dallas on Halloween night in 2009. In 13 Calder Cup Playoff contests, Thuresson tied for fourth on the Admirals with three goals, and added three assists for six points. In addition, he skated in three games with the Nashville Predators. In 2009-10, Thuresson registered three points (one goal, two assists) in 22 contests with Nashville, making his NHL debut on October 31, 2009 vs. Dallas. He tallied his first career NHL point with an assist on November 7, 2009 at Los Angeles, and notched his first NHL goal on December 31 at Columbus. Thuresson has appeared in 25 career NHL contests with Nashville over two seasons. The 6-1, 215-pounder has skated in 277 career AHL contests with Milwaukee, registering 53 goals and 65 assists for 118 points, along with 134 penalty minutes. He made his professional debut on October 6, 2007 at Peoria, and recorded his first professional point with a shorthanded goal on October 19, 2007 vs. Iowa. In Calder Cup Playoff action, Thuresson has appeared in 37 career contests with Milwaukee, registering eight goals and 11 assists for 19 points, along with 34 penalty minutes. He established playoff career-highs with seven assists and nine points in seven contests during the 2010 playoffs. 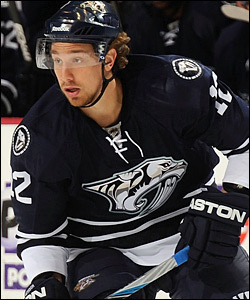 The Kristianstad, Sweden native was originally selected as Nashville’s fifth round choice, 144th overall, in the 2007 NHL Entry Draft. Dupont, 24, skated in 72 games with the Hartford Wolf Pack/Connecticut Whale (AHL) last season, registering 14 goals and 31 assists for 45 points, along with 78 penalty minutes. He also made his NHL debut with the Rangers on January 22 at Atlanta.